It was raining from the morning. I could not even go to the bakery to get some breads, so I had some cereal bars as breakfast. Then I watched "Shawshank Redemption". Actually it was the first time to waych this great film. As everyone said, it was a good movie. When I finished watching, it got sunny, so I was getting ready to go out for lunch, then Paul visited me. He could not return to Pucon yesterday as a few things happened. We went for lunch togeter at an eatery nearby his hostel. The sky got cloudy again and the rain poured. So we stayed at the eatery for a while and had a good conversaton. After lunch, I visited his hostel and talked with Paul till 7:30pm or so. I met Rosana from Germany here, who I met at Moai Viajero B&B in Santiago. What a coincidence! As I got hungry we went out for dinner. Paul was going to reat me a steak, so we walked to a steakhouse. But those 2 girls eating a pizza at the next restaurant called us to join them. So we did. They were Hanna from UK and Goody from Austria. With their company we had a good time. Well, we will leave here to Argentinian side tomorrow. We are planning to take a small pass to Argentina, involving a lake crossing with a boat. It sounds fun but hopefuly the road would not get muddy with the rain. It was clouded and llittle drizzling this morning. I went to the bakery to get some breads and came back to the campground, then I had the breads with a cup of coffee. An excellent moment. It got sunny after 11am just like yesterday. I assume it would be like this everyday around here. 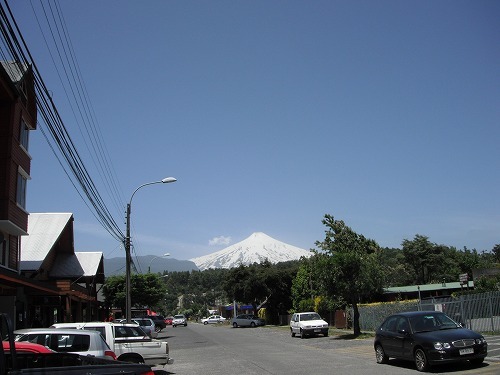 Here in Pucon, there are lots of activities I could do, hiking up Volcan Villarrica, rafting, mountainn biking, visiting thermal springs etc. But everything is expensive, so I just walked around the town. I was thinking to have a lunch at the cafe I went yesterday (as there was WiFi),but I found I could get WiFi on the campground (from the hotel next door), so I went to the supermarket to get 2 empanadas (a Pino and a Pollo) for 1,100 pesos. I had them sitting on a bench on a street, looking at Volcan Villarrica. What a view. I certainly enjoyed the lunch. Back to the campground, I sufrfed the net and had a nap. I was waiting for Paul to come back from Temco, but he did not turn up. So I visited his hostel, but a lady told me he had not returned yet. Well, if Paul does not come back here, what should I do? Should I continue the trip alone or should I wait for him?? It was clouded this morning. I went to a bakery to buy some breads for breakfast. I made a cup of coffee and had breads. After 11am, it became suny, so I took a shower and did laundry. I went to the town to have lunch. 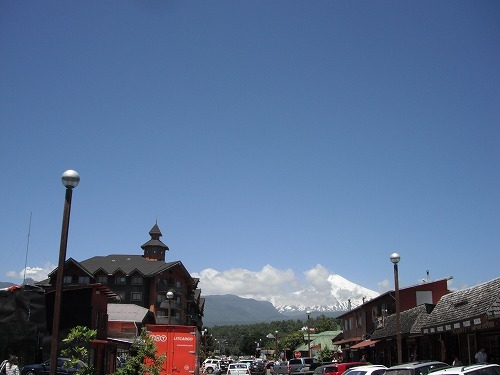 Today Volcan Villarrica could be seen very clearly from the town. Very nice. 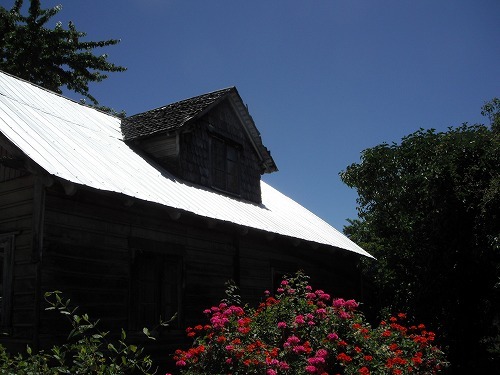 The town of Pucon is very touristic, but the buildings are nice and I like the atomosphere. I had a hot dog and a cuppa for 1,500 posos. Then I found a cafe with WiFi, so I had another cuppa and updated my blog. Back to the campground, I watched the BBC programme "The Story of India". I had breaeds for dinner. This is the cheapest option. In the afternoon, Paul cae to the campground. As he has to go to Temco for the service, I decided to wit him here. We will leave on Saturday or Sunday. It's 500th day since I started this trip! Time flies really really fast!! I was really exhausted yesterday. I went to sleep before 10am and woke up around 7:30am. I got up after 8am and started to get ready. I went to the hotel where Paul was staying around 9:30am and we left there around 10am. We refueled our bikes and went sounth on the route 5. Our first stop would be Temco, where Paul was intending to service his Yamaha. 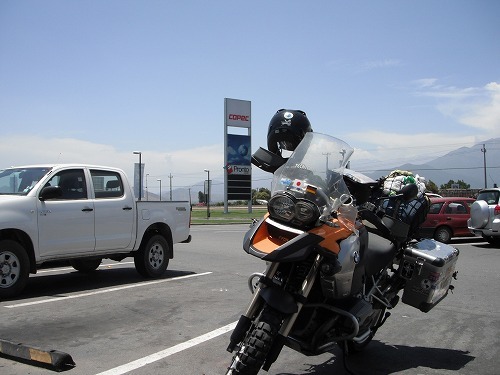 He had got only 6,00km on the clock, but as there would not be any workshop able to service his bike in Patagonia, he wanted to do 10,000km service there. Also he was planning to get a new set of tyres more dirt oriented. We had a caffee break at a petrol station on the way. Some how my fuel consumption was really bad. Usually my GS can do 22km / Ltr but it was 18.5km / Ltr!! Paul'S Yamaha had got the similar consumption, so we assumed that it should be due to the head wind. We got to the Yamaha dealer in Temuco after 3pm. The owner of the shop said he could not do the service today and the shop will be closed for a public holiday tomorrow. So his bike would be ready by friday afternoon!! So Paul decided to go to Pucon with me and spend 2 days there and retrun to Temco on Friday to do the service. There was a set of Heidenau tyres. The front cost 80,000 pesos (160US$) and the rear cost 120,000 Pesos (240US$). They were not as aggressive as TKC80 but more aggressive than Tourance. The pattern was just like Perreri'S MT60. It would be a good choice for this trip. We went back to the route 5 and turned to east at Freire. on the route 119, there were curves so I enjoyed riding through. We got to Pucon around 6pm. I pitched my tent at a campground (3,500 pesos) but as Paul does not have a tent, he went to find an accomodation. 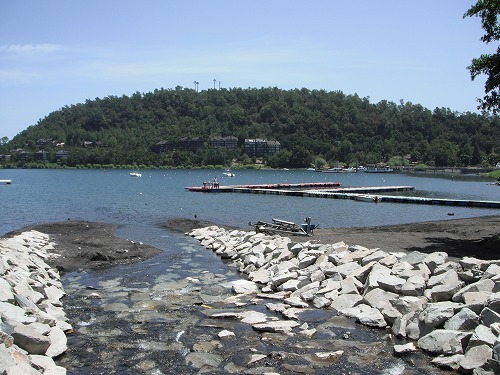 Due to the volcanic ashes, I could not see far away, but the town is located on a lakeside and very pretty. I might spend 2 nights here. I stayed at Shiomisou for 25days!! I did not plan to stay there such a long time but it was cozy and I had a great time with my friends there. Today everyone, except Yoshi DR650, left the hostel. Yoshi DR650 found a clack on his front rim, so he has to wait for the new rim. Hopefully he can get the rim soon and he can continue his trip down to Ushuaia soon. Yutaka will head south like me. But as he is on a push bike, we might not able to cacth up again on this trip. But if I decided to spend the new year at El Calafate, he might be able to get there in time. Ryu will go to Santiago, then go to San Pedro de Atacama. He will go north and will go back to Japan after the new year. 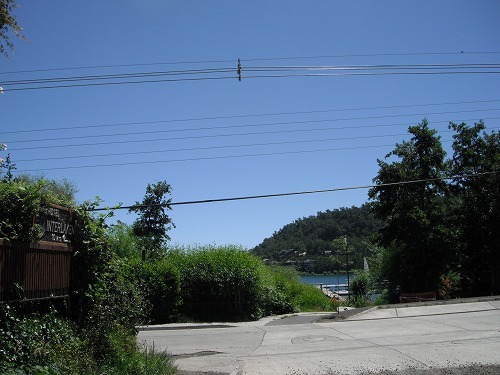 Shintaro will go to La Serina, but he was not sure if there would be a direct bus from Vina del Mar. So he might need going to Santiago with Ryu. He is thinking to spend Xmas and the new year in El Calafate or Ushaia, so we might be able to catch up. Everyone has a good trip!! I said good-bye to Mr. Yamagishi, the ower of the hostel, and left there. For more than 3 weeks I did not ride my GS, so I was a little nurvous. I went to a petrol station to fill up the tank and adjusted the tyre pressure. 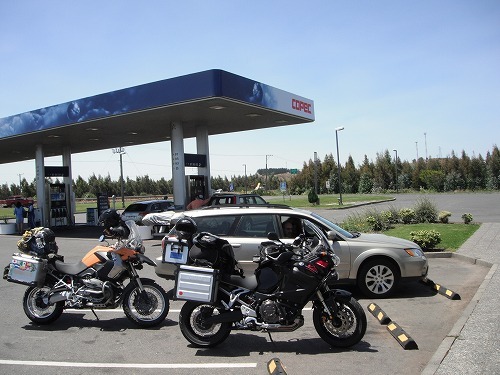 I rode on the route 68 to Santiago and bypassed the city to take the route 5 to south. The route 5 was boring and every 100km or so there was a toll, cost me 600 pesos each... I was cruising at100 - 110km/h. I found that my headlight bulb was blown. I changed it in Mexico City around 20,000km before. It blew up quicker tha I thought. Just before the townof Chilllan, I was having a break at a petrol station. Then I saw a brand-new YAMAHA XT1200Z Super Tenere came in. It was with full panners and a duffle bag, so he must be a traveller. It has a Chilian number plate. He got off the bike and came to me. He was also going to Chillan, so we rode together. As he was going to stay at a hotel owned by his friend's son, I parked my GS at the car park of the hotel, and I stayed at a hostel next to his hotel. There was a car spare parts shop nearby, so I could get a headlight blb there. 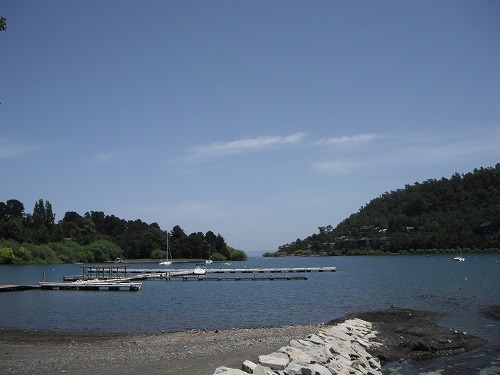 Tomorrow I will ride to Villarrica or Pucon with Paul.